This weekend will be one of DeVonte Holloman's biggest of his career. Not because of a big game on the line, but because the 2013 NFL Draft that starts on Thursday night. This is what DeVonte has worked so hard for and has been preparing himself for his entire football life, an opportunity to hear his name called by one of the 32 NFL team organizations. 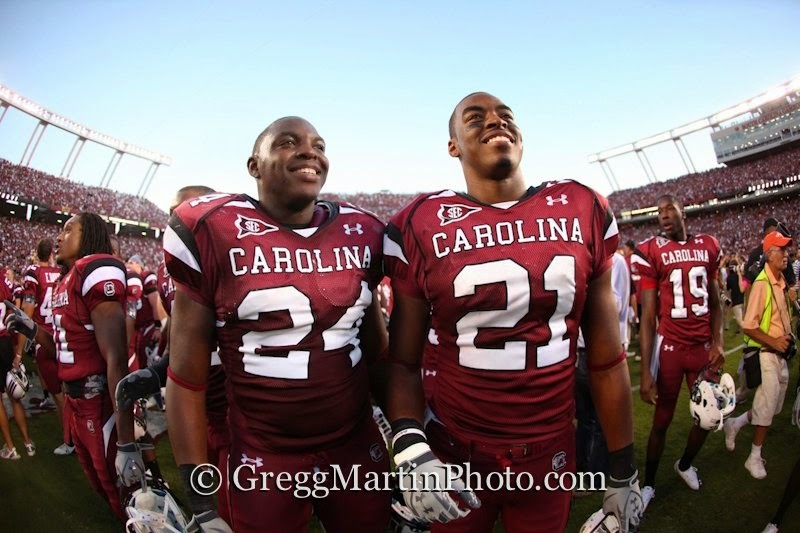 Upon arriving in Columbia in 2009, the coaching staff at South Carolina knew this kid could immediately contribute and contribute is exactly what Holloman did, even as a true freshman. Holloman appeared in all 13 games as a freshman and would log his first two career starts against the Tennessee Vols and Arkansas Razorbacks. Whether it was at the strong safety or linebacker (spur) positions, DeVonte made his presence felt on the football field. Holloman finished his career at South Carolina with 177 total tackles to go along with 2 sacks and 7 Interceptions, 3 of which came against in state rival Clemson. Holloman was invited to participate in the 2013 NFL Scouting Combine and was able to impress scouts with his size, strength and lateral movement. Not all reports were good, referring to his fluidity and straight-line speed, but all you have to do is turn on the tape of this guy to realize that his is exactly what you would want in a ballplayer; he never gives up on a play and always seems to find himself around the football. Here at BlockCBlog.com we recently had an opportunity to ask DeVonte a few questions about his career at South Carolina and the upcoming NFL Draft. BCB: There has been quite a few talented players to come out of South Pointe in recent years, you joined the Gamecocks in 2009 along with teammate Stephon Gilmore; both of you were early enrollees. How much does it help to enroll early? DH: Enrolling early gave me a chance to get adjusted to college classes as well as attend winter workouts with my teammates. I also got to go through spring ball and learn the playbook which was a major help also. BCB: One of our favorite plays of yours last year was during the Georgia game where you flew out of nowhere to dive and get your 6th interception of your career on Aaron Murray's first throw. It set the tone for the rest of the game defensively, tell us what you remember about that play. DH: I remember blitzing off the edge and seeing that it was a quick pass so I stopped blitzing. The ball was popped up in the air and I saw it as an opportunity to make a big play so I sprinted to it. About halfway to it I realized I wasn't going to make it so I dove and ended up beating Murray to his own pass. BCB: You were teammates with Hakeem Nicks during your time at Independence High School. Do you still talk and if so has he given you any advice on what to expect in the NFL? DH: I see Hakeem every now and then when we both have a break but for the most part we don't bother each other. He was focused on his season and so was I.
BCB: You've had 3 picks in 4 games against Clemson. How does it feel to never experience a loss to Clemson? BCB: Tell us about your experience at the NFL Combine. DH: The combine was honestly the worst experience ever. You do not get much rest in three days, between late night meetings with teams and early morning drug test and doctors visit. But it was an honor to go and I am glad I was invited. BCB: What are you doing right now to prepare yourself for the next level and do you talk to any of the other guys that are coming out about their draft process? Right now all I can do is continue to keep myself in shape for rookie mini camp which is not too long after the draft. As far as keeping up with my teammates, we all are in an iPhone group message and talk about our experiences and occasionally enjoy a couple of laughs. BCB: Having multiple scholarship offers from ACC and SEC programs, what seperated the Gamecocks from the others and what would you say sealed the deal for you? DH: The Gamecocks had great recruiters that were great coaches. Coach Beamer and Coach Johnson were honest and talking to current players at the time they were good coaches as well. SC was close to home and I had an opportunity to come in and compete for playing time my first year. BCB: There has been a long line of great players at the "Spur" position from Darian Stewart, Antonio Allen and then you. Who do you think could be next? BCB: What is something Gamecock fans may not know about DeVonte Holloman? We would like to congratulate DeVonte Holloman on all of his success at South Carolina and wish him the best of luck as he continues to chase his dreams of playing in the NFL. There is no doubt DeVonte will have his name called during the 2013 NFL Draft and will make an organization proud that they had the opportunity to draft this young man. We here at Block C Blog look forward to seeing DeVonte playing on Sundays and could not be more proud. Once a Gamecock, always a Gamecock.